Mali Mish - Day 177: Gulf shores of Mississippi. The parking lot we spent the night at was very pleasant. 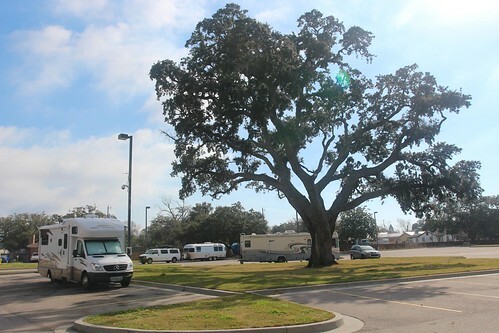 Unlike a Walmart or even a Cracker Barrel, there are no cars driving in and out of the place as it is for RV and over-sized vehicles only. We packed up and headed down the road along the gulf coast. This is all new to us as we never left the interstate last time around. We are going to try to stay along the coast for as long as we can while traversing across the state. We had grand plans of spending weeks exploring Mississippi and Alabama but our obligations in California in March are forcing us to abandon them. A lot of the gulf coast along Mississippi has suffered some very serious hurricane damage in recent years. It is evident as we drive around and see all of the empty concrete foundations where structures formerly existed. 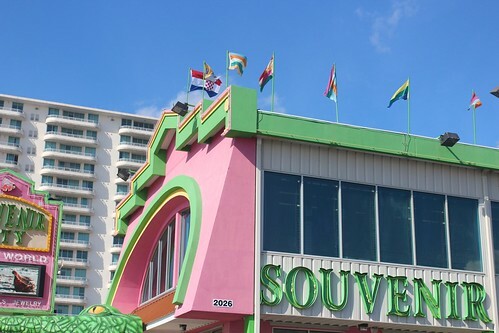 This pink and green souvenir shop however escaped such horrific fate. I am sure it was because of the Croatian flag (near the front with the red and white checkered design) it flies on its roof that saved it. 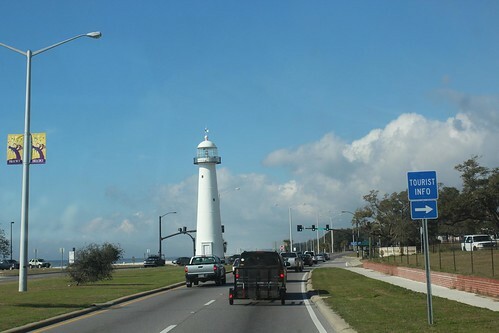 On the west end of Biloxi is a former plantation named Beauvoir. It is known as the historic, post-war home of Jefferson Davis. If you paid attention in American history in school, you would know that Jefferson Davis is the one and only President of the Confederate States of America. 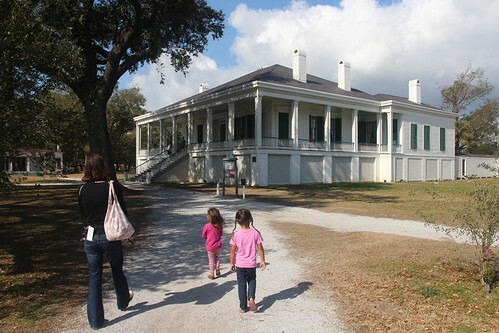 Beauvoir was Jefferson Davis’ residence in his late years. After the Civil War, he was imprisoned for treason. He was also banned from ever holding another elected office according to the 14th amendment. 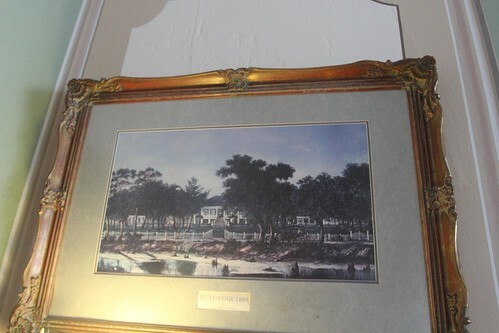 Sympathetic to his situation, Sarah Dorsey, the widow who owned the Beauvoir plantation, offered him a cottage on the property to live at and to work on his memoir. When she died of cancer at a relatively young age of 50, the property was willed to Davis and his wife. Beauvoir has suffered its fair share of hurricane damage as well over the years. The most recent one was caused by Hurricane Katrina that destroyed many of the structures as well as causing some major damage to the primary house. 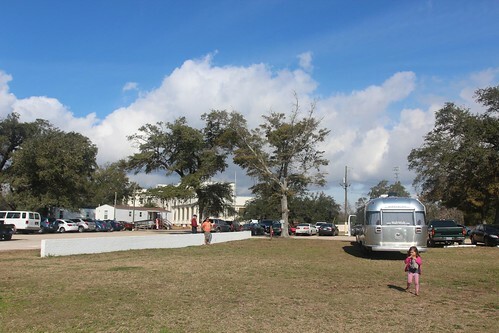 More than 7 years later, the visitor’s center is still housed in a mobile structure with a constant reconstruction going on to repair the existing structures as well as the building of a new Jefferson Davis Presidential Library. 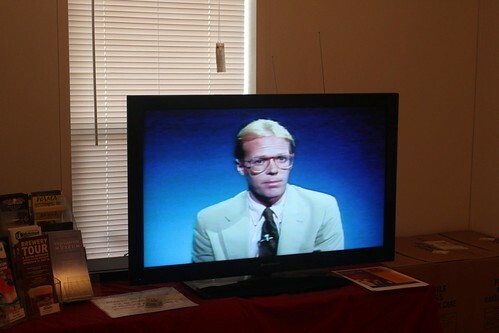 A lot of time and money has been put into rebuilding the property but apparently none of that money went into updating the 80’s era introduction video. During hurricane Katrina, as much as 30 feet of flood waters submerged the entire property. Much of the historical artifacts were damaged as it swashed around in the stormy water. 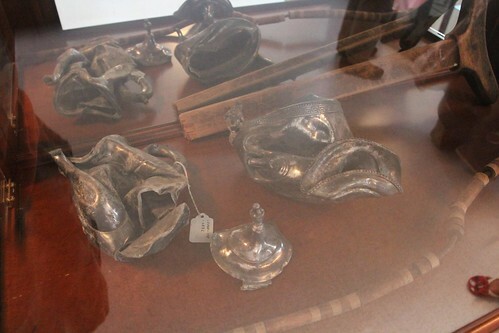 Some of them were recovered in its damaged state and are on display in the visitor center. 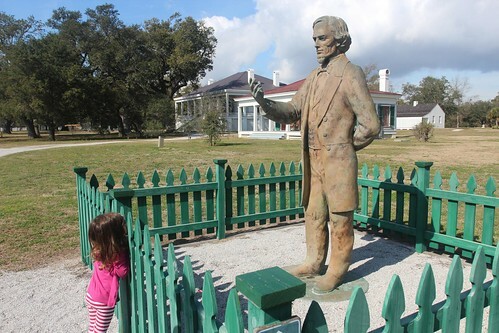 Mila here is getting a peek at the statue of the Confederate President. 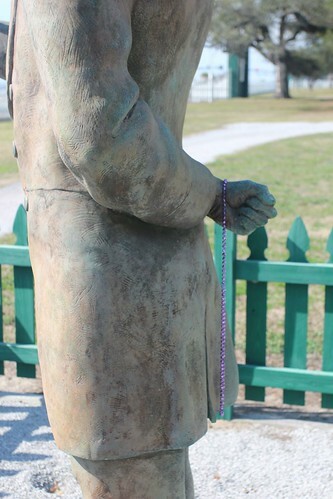 Apparently he is getting into the spirit of Mardi Gras. Like many of the homes along the gulf coast, the primary residence of Beauvoir is built several feet above ground. 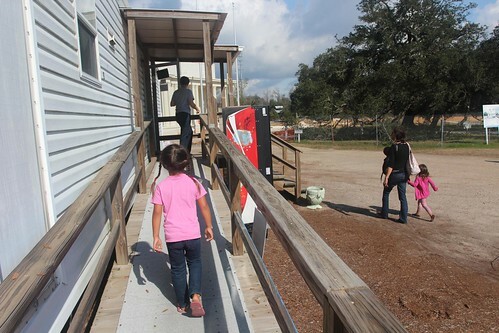 The main level of the house is probably a good 20 feet above sea level but that still proved not enough for Katrina. Most of the damage this building suffered is hardly noticeable any more. 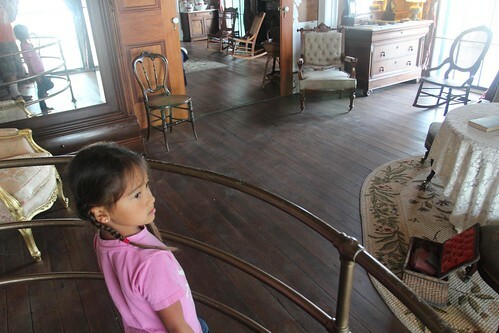 Over 80% of the furniture in this house is period accurate dating back to the late 1800s. 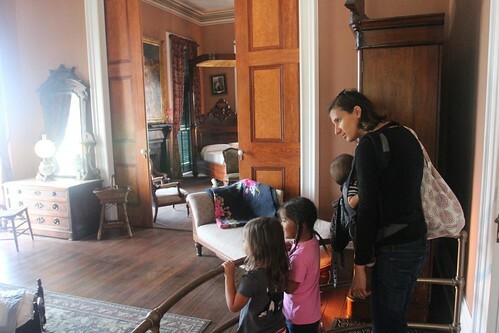 Some of them are the actual pieces what were here when Jefferson Davis lived here. 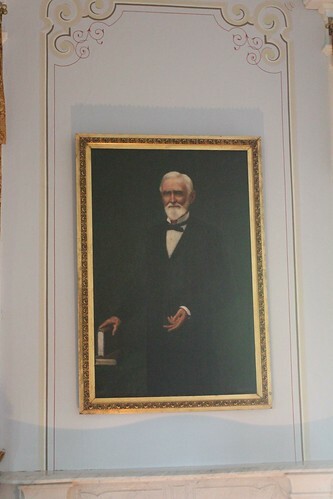 This portrait was painted of him while he was living here towards to end of his life. 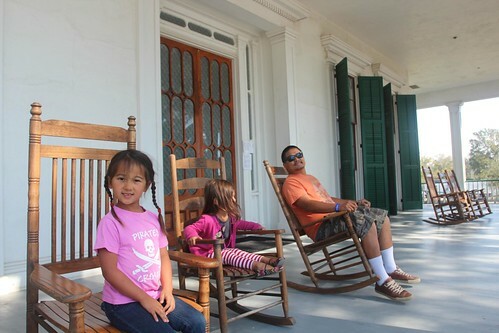 After Jefferson Davis died in 1889, the house was passed down to his daughter who owned it and lived in it for another 9 years. When she passed away, the house was inherited by his widowed wife. The property was sold to the Mississippi chapter of Sons of the Confederate Veterans with 2 stipulations. One of them was that it will open itself up to confederate civil war veterans and their wives who needed housing free of charge. The second stipulation was that once it is no longer a veterans home, it will be turned into a memorial to Jefferson Davis and his confederate soldiers. In 1957, the last of the confederate soldier widows were moved to a nursing home and it has been operating as a memorial ever since. One of the very interesting bits of information we learned on the guided tour was that young girls were often wed to civil war veterans on their death bed. The purpose was to allow them to receive their war pensions for life. Because it was such a common practice, the last of the civil war widow just passed away within the last 10 years. This photo was taken in 1883 of the property. The house is clearly visible in the center and the shoreline looks much different than it does now. The army corps of engineers have built beaches at the current shoreline to prevent erosion. On the property is a cemetery where many of the war veterans and their wives are buried who lived here. To qualify for residency, the veteran needs to have some type of connection to the state of Mississippi. Either he had to belong to a Mississippi regiment or has to have been a resident of the state at some point. 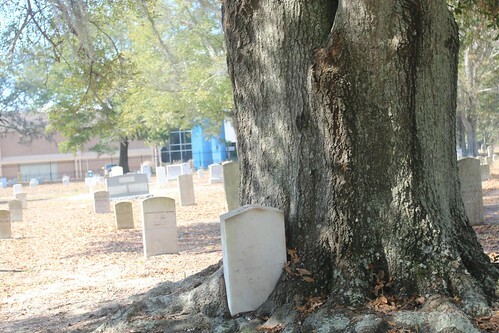 Some of these headstones have been here so long that these massive trees have literally wrapped its growth around it. Next to the cemetery is a pile of marble laying on the ground. 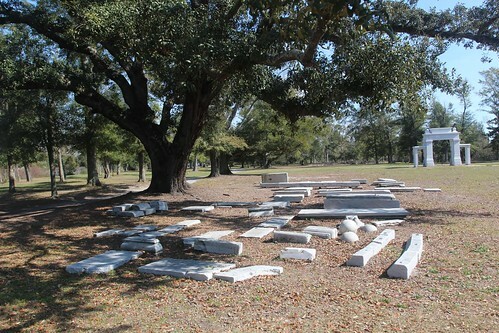 This was the marble entrance gate that was destroyed during Katrina and is now laying in the cemetery along with the vets. 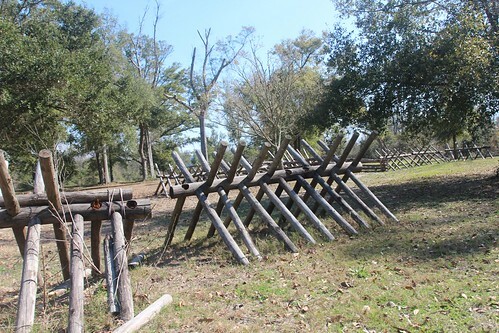 Each year, there are civil war reenactments that perform on site at Beauvoir. For a few days, the property transforms into a civil war battlefield with hundreds of re-enactors playing every imaginable part. Beauvoir was a very interesting stop on our visit along the gulf coast but it has lost a lot of its luster due to the damage from Hurricane Katrina. If you are a civil war buff you will definitely love it. Otherwise, wait for the completion of the Presidential Museum and Library which was still under construction while we were there. It should be complete within the next year or two. 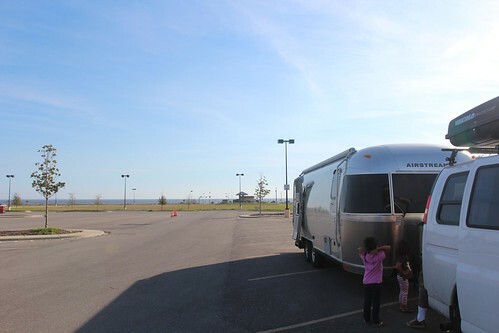 After we left Beauvoir, we headed further west and decided to stop at a little town called Long Beach, Mississippi. 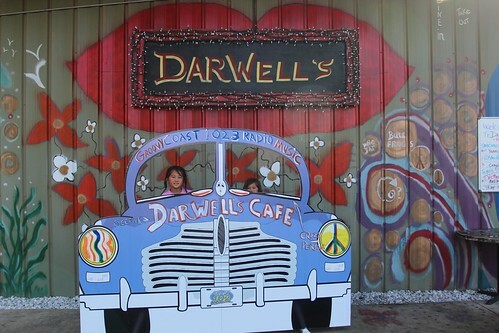 We had heard about a great little eatery called Darwell’s featured on Diners Drive-Ins and Dives and we just had to make a stop. 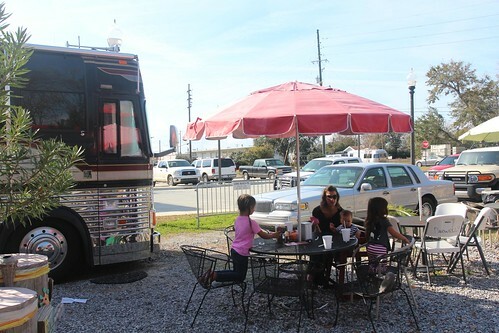 We got a nice outdoor table right next to a huge Prevost motorhome. I am not sure what the Prevost was doing there but it seemed appropriate for us to sit next to it. You can see in the photo above that we were able to park the Mish right across the street along the side of the road. As you entered the front door to order, the staff is extremely friendly. The owner and his son were there to give us a run down of what their specialties are. Nothing here is deep fried and we were handed a good sized sample of their crawfish etoufee which was amazing. They also do a really cool thing for kids which is for $5, they can make any dish into a kid’s meal. 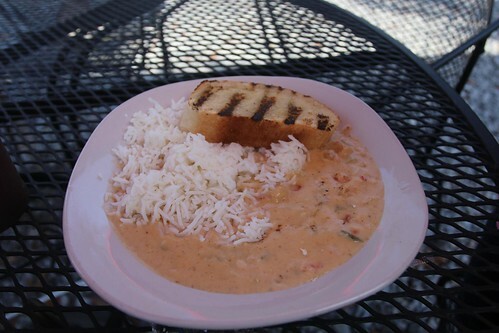 This is their delicious crawfish etoufee over rice for Ava for only $5. She loved every bite. 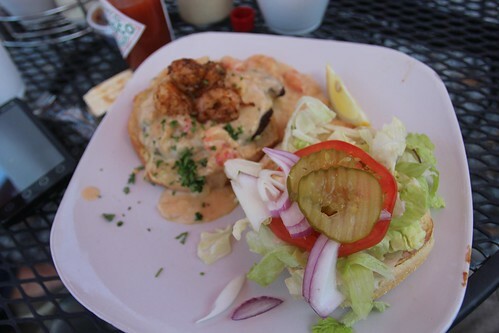 They also make a burger topped with that same crawfish etoufee which was an offer I couldn’t refuse. 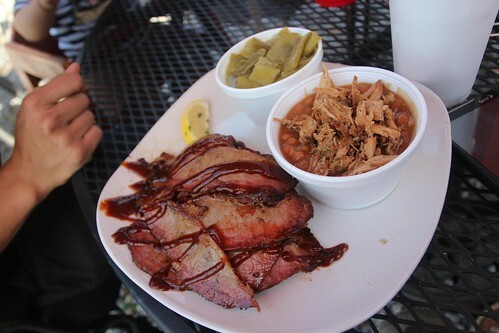 With all of that cajun goodness, they also make a hell of a BBQ plate. This plate of meat and beans was Marlene’s and she did not leave a single bite on the plate when she was done with it. With bellies full of Darwell’s, we headed down to a nearby Walmart that I have had my eye on for tonight’s stay. This is the beauty of Mississippi’s gulf coast. We got million dollar waterfront views for free in a Walmart parking lot. Tomorrow we will head into New Orleans. 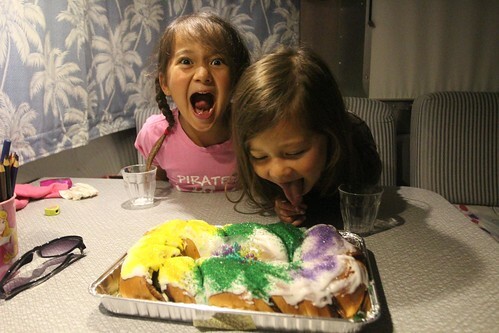 To get the girls into the Mardi Gras spirit, we got them their first king cake. Between the 4 of us, we devoured most of the cake in a single sitting. 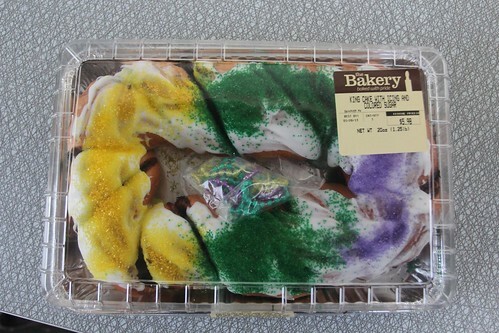 Thanks to the dairy free recipe, Marlene was able to join in on the Mardi Gras celebration. 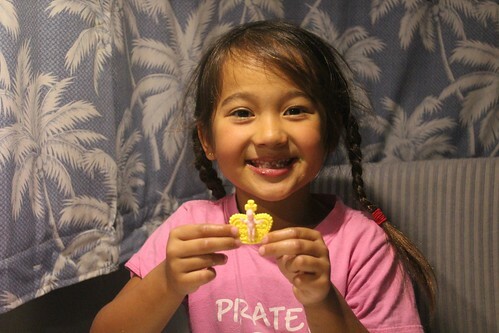 Here is Ava with her first baby Jesus from her first king cake. 4 Responses to Day 177: Gulf shores of Mississippi. Hey Dan, if your troup gets to Mississippi, try to go see the Vicksburg National Monument Park…it’s a drive thru thing…very awesome to see. Hey, just wanted to let you know, at boomtown Biloxi you can bring your kids to go eat at any of the restaurants. Did someone tell you that you couldn’t? Just curious. Jacob, we just saw a pretty prominent sign at the front entrance next to the security guy. i walked in there myself later in the evening and saw the restaurants upstairs. Seems like since we had to walk thru the casino to get there, they would not let the kids thru. Perhaps they would if we’d asked. Thanks for the heads up! I work there in security. Just don’t want you to miss out on the great food! ( I ate here waaaaay before I worked here). You can walk your kids through the gaming floor to go eat at any of the restaurants. Just give the Security Guard a heads up as to where you’re going and he/she will advise you that there is no stopping on the gaming floor with minors and if they need to use the restroom they must be escorted there by an adult 21 or over. Hope this helps!